My name is Jonas Mehlem and I'm a full-time volunteer at the Franciscan Outreach Association. 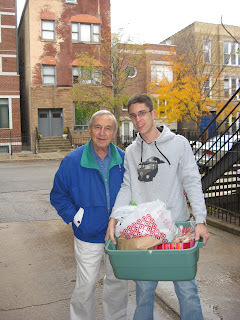 I came over from Germany to the US to volunteer for one year at the Marquard Center. By now I've been here for 5 months and had a lot of transformational experiences. I came to here to help people who are homeless, to serve a hot meal every night and help them survive. Before I started here I thought that serving this meal is really essential for our guests. But I soon realized that having food every night is not the only thing that our guests need. A lot of our guests just enjoy talking to me or other volunteers. They come to our place to stay in a warm building and to be together with other people. I never have to say much during a conversation with a guest. I experienced that just listening to their stories makes them happy. It also helps me to understand their situations a little bit better. Sometimes a story makes me sad and angry. One day a guest came to me and told me that he has to sleep on the street that night. The shelter that he used to go to was closed for the night. He told me the options he had for the night: Number one was sleeping on the street. But with negative 20 degrees outside this wasn't his favorite option. Number two was checking himself into a hospital, then he could stay in a warm room. But he still wouldn't get much sleep through that. His last opportunity was to sleep in an empty old house somewhere near us. But for that he would have to break into this house. He never told me which option he chose, but he told me that he only slept an hour that night. It makes me sad to see that people have to sleep on the street while the temperature is negative. I realized how lucky I am to have a bed for the night and to have enough food everyday. I can cook and prepare my own food. I can choose what I want to eat and I don't have to worry about having a place to stay each night. This work here showed me how important it still is to help other people and to be there for them.